Bagpuss originated in a 1974 UK children's television series which was created by Peter Firmin and Oliver Postgate through their company Smallfilms. The title character was "an old, saggy cloth cat, baggy, and a bit loose at the seams". Even though there were only 13 episodes of the show made, it remains fondly remembered and in 1999 Bagpuss topped a BBC poll for the UK's favorite children's TV programme. The programme would always begin the same way with a series of sepia photographs. The viewer is told by a narrator of a little girl named Emily who owned a shop. However the shop did not actually sell anything but instead Emily would find lost and broken items and display them in the window of her shop hoping their owners would one day whilst walking past come in and claim them. Bagpuss, oh hear what I sing. When Emily had left, Bagpuss would wake up and all the various toys in the shop would also come to life including Gabriel the toad, and a rag doll called Madeleine who would then all discuss what the new object was telling stories about it and singing which would magically mend the broken item. Eventually the newly mended item that Emily had placed in the window would be claimed and then dear Bagpuss would start yawning again, and as he fell asleep the narrator would speak as the colour faded to sepia and they all turned back into toys. 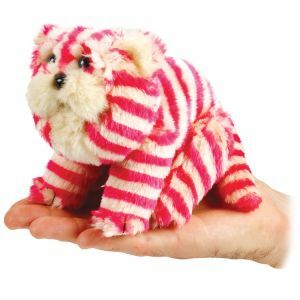 Today Bagpuss seems as popular as ever and we now stock 'Yawning Bagpuss'. Just squeeze the belly and Bagpuss plays a musical tune and has a big yawn at the end.